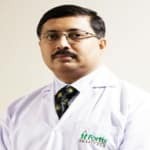 Dr. Ronen Roy is an Orthopaedic Surgeon of international repute and is an expert in all forms of Orthopaedic Surgery with a special flair for Joint Replacement Surgery, Management of Complex Trauma; and Diagnosis, treatment, and management of Osteoporosis. After completing his MBBS from Calcutta Medical College, Dr. Roy went on to finish his FRCS from the Royal College of Physicians and Surgeons, Glasgow. In the course of his illustrious international career, Dr. Roy has also served as a full-time lecturer in Orthopaedics and Trauma at the University of Wales, Cardiff. He is a member of the faculty for many basic, intermediate, and advanced courses in Joint Replacement Surgery. I am 61 years old male retired govt. Servant. I am suffering from leg knee joint pain on both legs for more than 6 years. I am diabetic for past 1 year. Asthmatic for more than 40 years. For the past six months both legs muscles sprain over and below the knee on backside. Due to skin allergy or varicose vein problem I am having wound in the left lower leg not healing for about 4 months. I need advice for knee pain and wound healing. Hi sir. Hope you are fine. For your asthmatic, consult a pulmonologist, regular practice of pranayama will help you. U may have vitamins deficiency like vit e. U can consult a vascular consultant for varicose. Regular strengthening exercises necessary for your knee. Do ankle toe movements frequently to increase blood circulation to calf muscles. So back pumping will be good. I'm suffering from pain in my Lower Back. It usually pains when I sit for a Long time and during rushes. Apply hot fomentation twice daily. Avoid bending in front. Postural correction- sit tall, walk tall. I had problem in my leg it pains at night and I can not get sleep properly give me proper solution. Hello doctor, I am 26 year old boy and I am suffering from right rib pain from 10 days and I have consulted with doctors but still the pain is same, I am not getting relief from pain Please tell me doctor what to do? Take medicine Rhus tox 200 and rhododendron 30,4-4 pills thrice a day and report thereafter for further treatment. Besides this keep yourself warm, hot fomentation around ribs to be done, be hydrated, apply some massage oil, take steam inhalation. For more queries, contact us. HELLO. I'm 36 Yrs, I'm suffering from backbone, shoulder since 4 years. I couldn't bow down and stand long time. Many time visit bd Dr. Use some gel, medicine. But no benefit. please do help me soon. please help. Dear Lybrate user. I can understand. Upper back pain can occur as a result of trauma or sudden injury, or it can occur through strain or poor posture over time. The vast majority of cases of upper back pain are due to Muscular irritation (myofascial pain) or Joint dysfunction. Please work with your ortho specialist for diagnosis and cure. Take care. 5 Symptoms Of Broken Nose! Sometimes the impact of the blow, which has caused a fracture in the nose can also result in a neck injury. If you wish to discuss about any specific problem, you can consult an Ent Specialist. I have joint pain in waist and legs. I can't sit in one position for more than 5 mins. My bones are week. I am 18 years old boy. I have to many grey hairs and my joints pain a lot and how to remove the stretch marks from body? Wiesbaden 30 one drop daily for one month 2. Berberis vul q 5 drop twice daily in a cup of wter for one month. I have Polio in both legs and scolorosis in spine. My spine getting little bend to left side, due to this i am unable to use right hip, i mean i am sitting on left hip only. Is there any way to improve? The condition can be greatly improved by continuous shashtik shali swedan, taildhara & use of maamsa & asthi pachak dravyas. Please contact some panchakarma expert in your area or call us. I have got mild frozen shoulder on left side. What is the reason for this and what is the treatment?